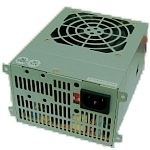 This refurbished power supply combines the famous A-Open-quality and its low 300 Watt with almost silent operation. It is TAV and CE approved and it features newest technology with Ultra Quiet Technology. Suitable for X312c or X323c Iyonix PCs. This item is expensive due to it being non standard, and rare. Advance Exchange unit, return your old PSU within two weeks, failure to return will result in a £25 charge. Exchange units must be repairable, complete, no repair attempted and without significant corrosion. Price: £69.00 no VAT to pay!